Gloucestershire-based County Clearance can empty your house, shed, garden or garage in a fast, cost-effective and discreet manner. Established and widely recommended, County Clearance can carry out a full or partial house clearance for you anywhere in Gloucestershire and the neighbouring counties. Usually available to start a house or rubbish clearance at very short notice, we offer a professional, speedy and discreet service to our clients at a competitive price. We can empty a few items right through to the entire contents of a property and the outside areas, often including attics, outbuildings, sheds, greenhouses and garages. Our house clearance service is honest, ethical and value for money. Confused by house clearance? Read the frequently asked questions we are often asked. We aim to recycle as much of the contents we remove as possible in order to reduce our carbon footprint. Any cleared items that cannot be recycled might have to end up in landfill but these are few and far between. Disposing of waste products in landfill sites is an incredibly expensive process with the Government charging a tax at the standard rate of £91.35 per tonne (from April 1st 2019) to dispose of biodegradable items by tipping! Landfill tax was just £7 per tonne when first introduced back in 1996 - an increase of over 1205% in just 23 years. The purpose of landfill tax is to deter us from sending waste to landfill sites or 'tips' and encourage us all to recycle. This means that as much as possible collected by County Clearance is recycled wherever possible, right down to the last teaspoon, pillowcase, paving slab or mixing bowl. Thank you for your efficient work on clearing mother's bungalow last week. The process was quick, simple and a weight off my mind. I'm happy to enclose your cheque. 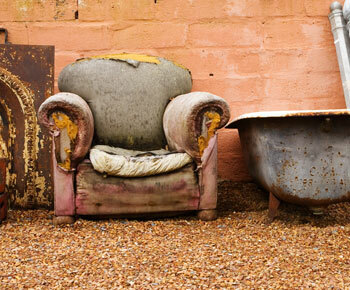 House clearance firms often tend to have either a grubby image, or else be stuffy and elitist. That is not just our opinion, but what many of our customers have told us in the past. As a modern and forward-thinking local firm, we are different. We are honest, transparent and ethical. The team at County Clearance are experienced, local and hardworking. We have a selection of different-sized commercial vehicles available, including a Luton van with tail lift, allowing us to get the job completed swiftly and offer the very best rates available in Gloucestershire. Whether you need just a spring clean, help with downsizing, or need the entire contents of a house disposing of, County Clearance can carry out the work for you. Our competitive charges include labour, insurance, fuel and waste disposal charges. If you ask us for a fixed priced quotation for your clearance, it will be fully inclusive of labour, insurance, fuel, and waste disposal charges. We are not registered for Vat which automatically makes us 20% cheaper than some other house clearance firms. We are able to visit you at most times of the day including early mornings, daytime, evenings and weekends. We appreciate that the situation you find yourself in can often be a stressful and difficult time. We will go out of our way to both help you get things sorted and to gain your business. We are often described as being reassuringly practical and straightforward whilst still being respectful and dignified. We donate to charity, with the British Heart Foundation, The Salvation Army, Sue Ryder and cancer charities being our favourites. County Clearance are fully insured, including public liability insurance, and authorised and licensed by the Environment Agency to transport and dispose of waste products. We donate many items to charity for re-use and also for them to sell. The British Heart Foundation, The Salvation Army, Sue Ryder and cancer charities are favourites, but let us know if there is a cause you would like to help. You can call us anytime, seven days a week, on (01452) 452015 for expert advice and a no-obligation quotation. You can email your message to us at clearance@countyclearance.co.uk with your enquiry. We cover all areas of Gloucestershire including Gloucester, Stroud, Cheltenham, Tewkesbury and Cirencester.